Today marks the five year anniversary of the shooting which devastated my high school. I’m Kaylynn Hill, a proud alumna of Chardon High School, who has grown up here my entire life. As I reflect on the day, I wanted to share my story and the impact on my small town in Chardon, Ohio. Currently, people often describe me as a kind and passionate leader, but this was not always the case. In fact, before the shooting, I was a very shy person. I did not really get involved in many school functions or even speak unless spoken to. As a sophomore, I did not have any plans after high school graduation or even concrete life goals for that matter. I was just a kid trying to get through my high school courses and go to football games with my friends. I fit perfectly into my small town of Chardon. Chardon is the kind of small town where everyone knows one another. You can walk down the street with your dog and see your barber, your history teacher, or your mom’s childhood friend. Chardon has always been a place where I just feel at home and so many others do too -- it was even recently named one of the best places to raise a family. The morning of February 27th, 2012, shook the Chardon community to its core. I remember walking into my first period English class as if it was any other Monday morning. Why think otherwise? Of course, it was not just any Monday. Even five years later, I still have flashbacks when I hear sirens or wear the same shirt I wore on that day. Although February 27th turned into a day that the entire Chardon community will never forget, our healing process is the story I want to share -- it’s how we moved forward. One Heartbeat, One Community. High schoolers never stop to think that a few moments can drastically alter the course of their life. The shooting was a turning point in my life and so many others because it reminds you how much you take for granted. We are so caught up in the rat race of making it through those four years that we never take a moment to appreciate the people and pleasant events that we have in our lives. 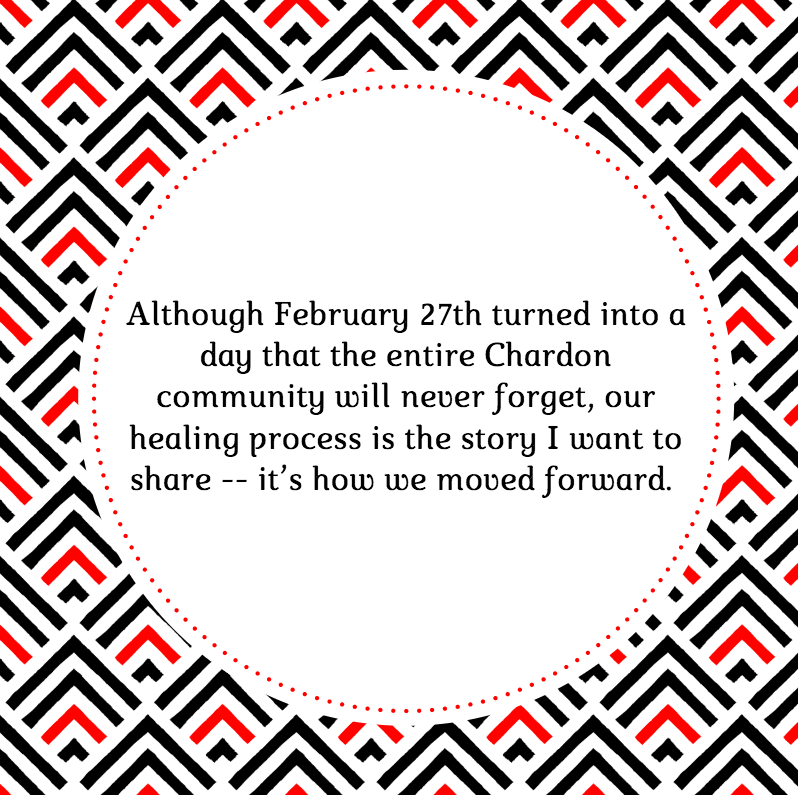 February 27th opened our eyes to the fact that tragic things can happen anywhere, to good people, and even inside of our comfort zone in Chardon. It’s very easy to believe the tale of invincibility and go through life living the motions. The shooting really shook up those beliefs. A few months after the shooting, a group of Virginia Tech students came to deliver our first school-wide assembly at Chardon High since the shooting. This group was Actively Caring for People (now Actively Caring). While presenting, every single person was hanging onto the words of the student leader, Shane McCarty, who spoke Shane McCarty. Although there were over 1,000 students and faculty, you could hear a pin drop in the gymnasium. The Actively Caring message was simple: recognizing people for going above and beyond for each other. It was this presentation that helped so many people find their purpose after the shooting. This purpose was to serve others at school and in the community. I knew—Chardon knew—that Actively Caring would be the vessel in which we sustained the compassion after the shooting and begin to move forward in our healing process. The construction of that vessel began immediately following the Actively Caring presentation. Students—including me—were invited to workshops with the Actively Caring coaches, where we were given the language and tools to bring Actively Caring into our school and into the surrounding community. We started with an appreciation luncheon for our school’s staff. Our focus was to give back to the many people who had helped us throughout our healing process. Throughout the next few years, the club expanded and completed other service-oriented events such as: a yearly Valentine’s Day dance for the elderly community, “Kick It For Cancer” kickball event, and creating a “27 Acts of Kindness” challenge. In addition, the college students from Virginia Tech (aka Actively Caring coaches) empowered us to go into our local middle schools to lead mini-lesson plans on how to bring Actively Caring into their school. Throughout all of these events, not only were we giving back to the community but we were also gaining transformational experiences ourselves. We were gaining leadership, communication, and service skills. Actively Caring empowered me to shift from the shy individual that I once was into a passionate leader. I often think back to the morning that Actively Caring came to Chardon. It’s amazing that one or two events in your life can completely change your life course. Before Actively Caring, I did not have any clear goals that I wanted to achieve. It has become an integral part of my life. I brought Actively Caring with me to college. I mentor students on how to spread kindness in higher education. Through my mentorship role, I discovered my passion for making a positive impact on college students, and thus will be pursuing a masters in student affairs administration. Actively Caring has helped me realized my purpose to serve others and has given me the voice and the tools to create a lasting impact in the world around me.